For this week’s mystery object I’ve decided to stick with my favourite subject of skulls. This time it’s a bird from the Dead Zoo’s collection, that was in a drawer labelled “Unidentified” – let’s fix that! Any idea what species this skull belonged to? I have my suspicions, but I’d love to hear what you think. As always, you can leave your clues, questions and suggestions in the comments section below. Have fun! Now it’s not a particularly difficult species to identify for a keen birder, so I asked for cryptic clues to the identity, and I was not disappointed. Some suggestions were so cryptic I still haven’t managed to work them out! Clearly it’s a different bird (one which mimics the appearance of a female Sparrowhawk) and it’s not quite the same as the mystery object – although there are similarities. However, we must keep in mind that Jennifer is of the North American persuasion, so her thoughts on Cuckoos will probably veer towards the Black-billed Cuckoo or Yellow-billed Cuckoo (or maybe the Mangrove Cuckoo, but that’s not as widespread as the other two). Black-billed Cuckoo (left), Yellow-billed Cuckoo (right). Watercolour by Louis Agassiz Fuertes between 1910 and 1914. The last few months have been particularly busy for me as I’ve been working on a lighting project in the Irish Room of the Dead Zoo in Dublin, so I’ve not had much opportunity to dig out mystery objects and get good images for you to identify. For a some of you this will be way too easy, so let’s have your best cryptic clues, hints and riddles as to what this is. A synsacrum is a fused section of vertebrae including the sacrum (which is where the pelvis attaches to the spine). General opinion quickly agreed with that suggestion, but the taxonomic group that the synsacrum belongs to remained unguessed. 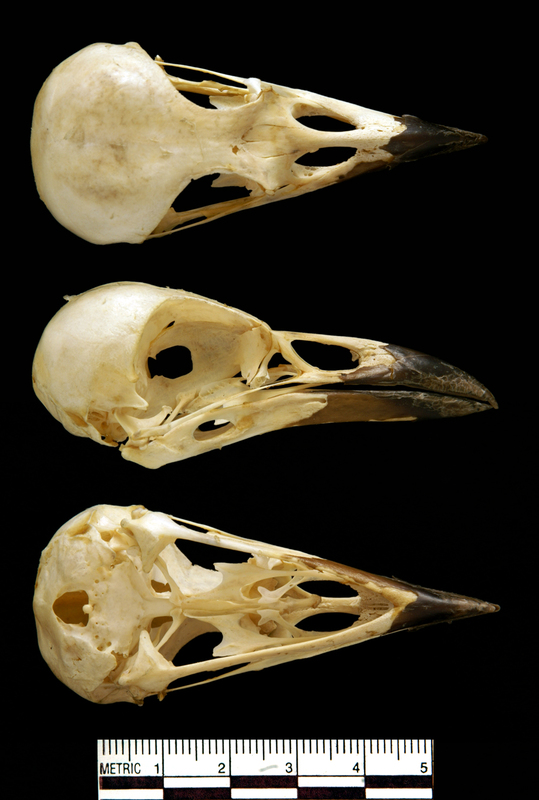 That is perhaps unsurprising, since it’s hard to find good comparative images of bird synsacra, especially with the hips and lateral (or side) bits knocked off and worn down. 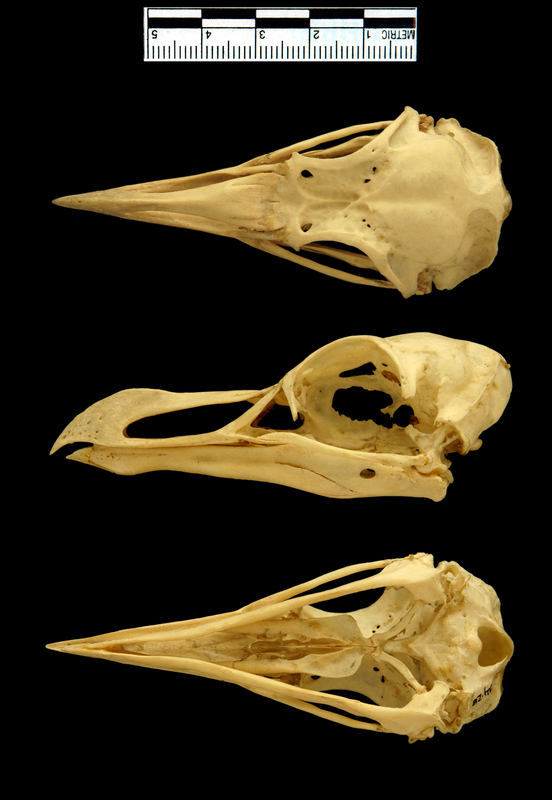 I had a go at looking through some of the comparative bird osteology collections at the Dead Zoo to get a feel for birds with a similar synsacral morphology. The usual suspect for a bird bone found in the Thames (for me at least) is Chicken, since they’re so closely associated with humans and a lot of the bones washed up on the banks of the Thames are from butchery and food waste. The size was about right, but the vertebral centra (the middle bits) of the Chicken synsacrum become more narrow in the hip-line than in the mystery specimen. 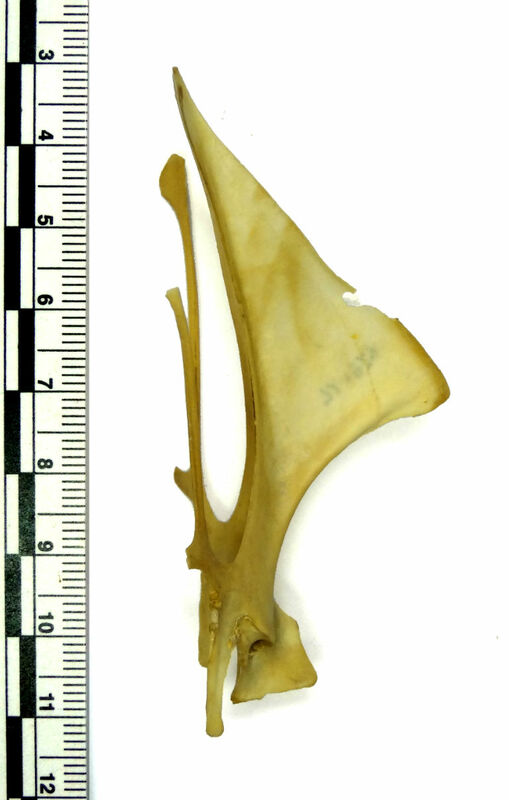 Now this doesn’t mean to say that the mystery object is certainly from a Herring Gull. I would want to have the object in my hand and comparative material available from several specimens to check the identification before being sure, but on the basis of the images that Keith Dunmall kindly provided, I think we’re in the right ball park. The suggestions were all suitably cryptic, with some nice puns thrown in for good measure, but the gist of all of them was clear that this is the sternum of a bird. After that point, the suggestions started getting a bit more varied, including reference to marine birds. Responses on Twitter were a bit more varied, ranging from ‘part of a human face’ to an essentially correct answer (admittedly after a bit of Q&A). If you’re a regular reader you may recall that I featured a sternum a few months ago from the Grant Museum of Zoology, that had a disappointing answer, but nonetheless an answer that provided a number of sternum images that may have helped with this object. 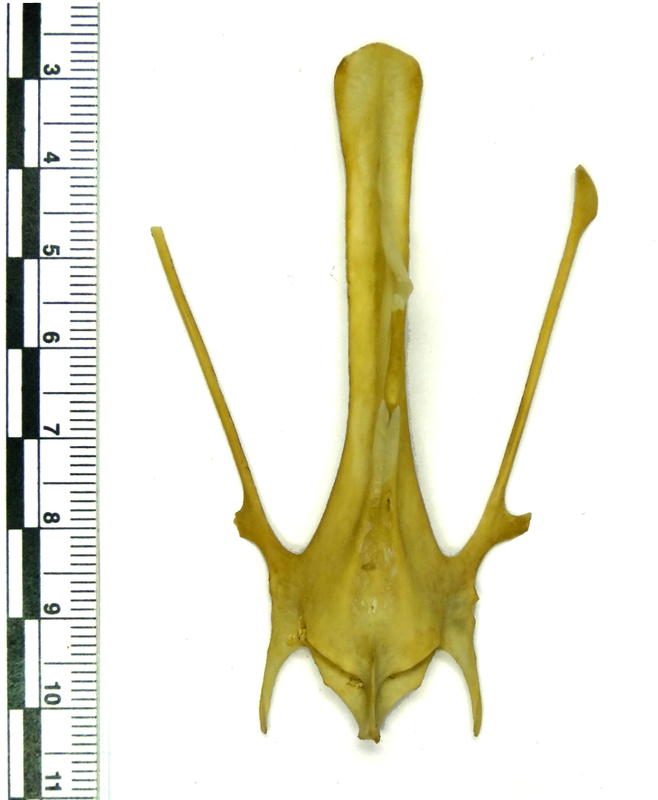 The long lateral trabeculae (the mystery specimen is upside down, so they’re the side bits that point upward on either side) with a deep gap between them and the carina (the central keel area) is very distinctive to the Galliformes, as you can see in this Chicken sternum. Sadly, there is no comprehensive repository of sternum images available online (if I’m wrong please correct me! ), so expecting a species identification on this one was a big ask. Instead I’ll just tell you that it’s from a Hazel Grouse Tetrastes bonansia (Linnaeus, 1758) and this one was collected in Russia and accessioned by the Dead Zoo in 1929. Hazel Grouse, by kallerna, 2009. These secretive birds occur across Eurasia, from Japan to as far west as eastern parts of France. They live in coniferous forests and feed on plants and insects, like most of their pleasantly pheasanty family. As many of you worked out, the skull and call belong to quite different species that share a love of the seaside. 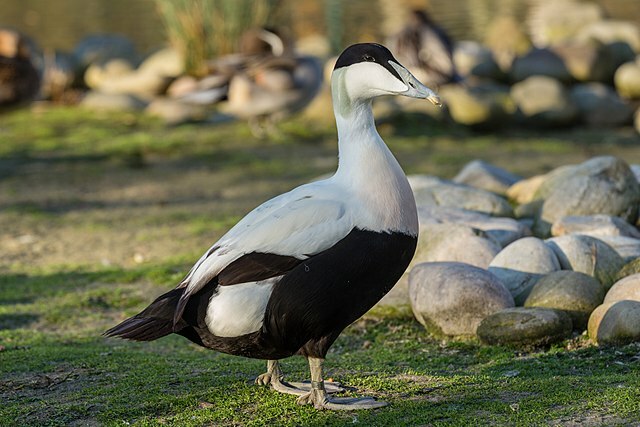 The call belongs to the somewhat enigmatic Common Eider Somateria mollissima (Linnaeus, 1758) as identified by mark b, Chris, Melanie, Henry McGhie, Anne Åslaug Holder and stuart petch. These large marine ducks are at home on the water, where they feed on molluscs and crustaceans. They are probably best known for their super-soft downy breast feathers, that the females use to line their nests and humans use to fill their pillows. 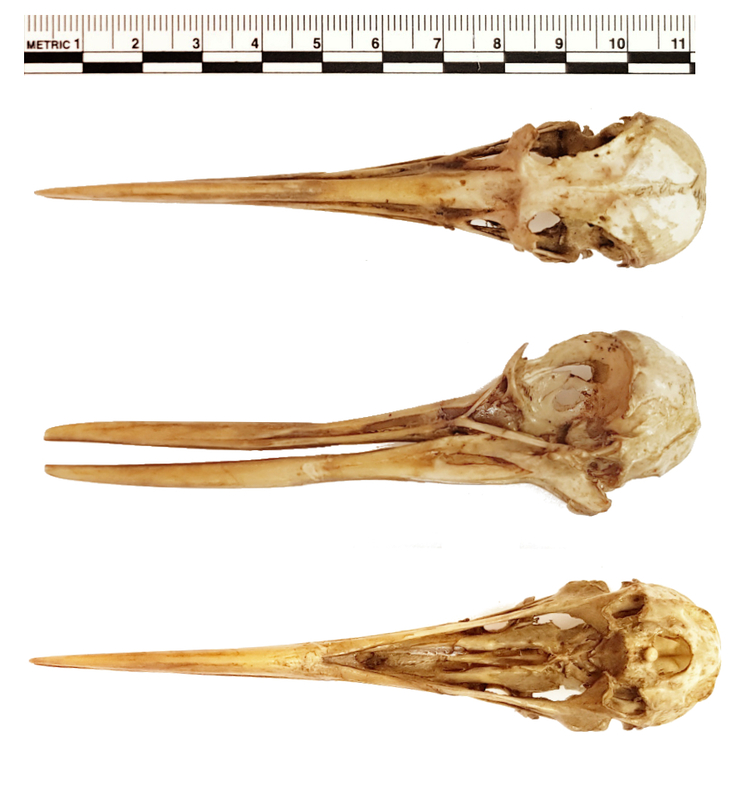 The skull belongs to a Razorbill Alca torda Linnaeus, 1758, as identified by Ric Morris, mark b, Chris, Melanie, Henry McGhie, Anne Åslaug Holder and stuart petch. These birds are great divers, using their wings to ‘fly’ underwater. They feed on small fish and other slippery critters, caught using that characteristic bill. Congratulations to everyone who managed to work out what the two species were – there’ll be a final mystery sound from the British Library Wildlife Sound Archive to identify next week, courtesy of curator Cheryl Tipp! Once again I have a genuine mystery object for you to identify this Friday. I have been going through some of the material from the old King’s College Collection in an effort to identify some material with no data that would be suitable for the Horniman’s handling collection. Please leave your comments and suggestions below and let’s see what we come up with!